Nearly ten years ago, for reasons I don’t remember, I started reading Patrick O’Brian’s Aubrey-Maturin novels. Set in the era of the Napoleonic Wars, the novels follow the exploits of Captain Jack Aubrey of the Royal Navy and Stephen Maturin, his ship’s surgeon and best friend. Hearing of my interest, a friend recommended I read Bernard Cornwell’s Richard Sharpe novels, which are set in the same era but tell the story of the conflict from the point of view of a soldier in the British Army. For some reason, I ignored his suggestion. A few days ago, however, I was casting about for something new to read and seeing the Aubrey-Maturin novels on my bookshelves reminded me of my friend’s suggestion. So I went to Amazon, found the first book in the series—Sharpe’s Tiger—and began reading. The book opens with Richard Sharpe, a disgruntled twenty-something private, contemplating desertion from the army. The work is boring, the pay is bad, his immediate superiors are corrupt, and army discipline is brutal. Indeed, Sgt. Obadiah Hakeswill—Sharpe’s immediate superior—conspires to trap Sharpe in an offense that will get him flogged with 2,000 lashes, effectively a death sentence. As the sentence is being carried out, however, a summons from Gen. George Harris saves Sharpe from the lash, only to send him into deeper peril on a mission behind enemy lines. Sharpe’s exploits behind those lines constitute the bulk of Cornwell’s fast-moving narrative. Like other writers of historical fiction, Cornwell has taken literary license with the British Siege of Seringapatam in the spring of 1799, though he helpfully explains where he has departed from history in “Historical Note,” at the end of the book. 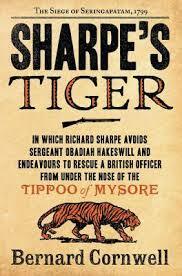 Sharpe’s Tiger is the first book in the series, chronologically, though it was not the first published. That honor belongs to Sharpe’s Gold. I recommend reading the books chronologically, however, because that gives you a better sense of the history of Britain’s wars as well as the evolution of Sharpe’s character.